Kyneton, a rural town 75 km north-west of Melbourne, is a few kilometres west of the Calder Freeway. Until 1995 it was on the Calder Highway. The town is bordered on its west and south by the Campaspe River. In 1839 the Carlsruhe pastoral run was split, and the part around Kyneton was named St Agnes. Two years later, one of the St Agnes run’s proprietors, Charles Wedge, built a slab homestead on the river flat at the corner of today’s Mitchell and Jeffreys Streets. In 1846 Wedge’s flat became a teamsters’ camping reserve, with the addition of a court house in 1848. By then Wedge’s lease-hold had been transferred to Henry Jeffreys who was in pastoral partnership with Lieutenant-Governor Charles La Trobe. It was during a visit to Jeffreys in 1848 that La Trobe decided to make the court-house site a town, and named it Kyneton after Mrs Jeffreys’ birthplace, Kineton, Warwickshire. 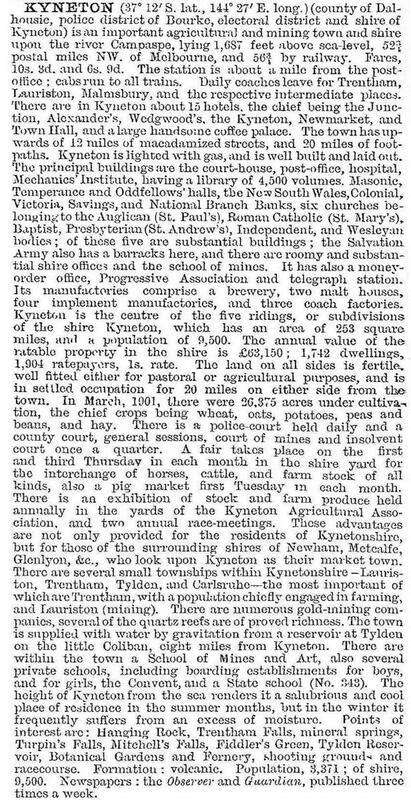 The town was named Kyneton when gazetted in 1850. Within less than two years Kyneton was a stopping place and supply point for traffic between Melbourne and the Bendigo gold fields. Gold was also discovered at Taradale, 15 km from Kyneton towards Bendigo. Between Taradale and Kyneton there were large deposits of good-quality bluestone for building. By the late 1850s Kyneton had a wide range of civic and religious buildings: Anglican church (1852, rebuilt 1856); Congregational church (1853, rebuilt 1860); mechanics’ institute (1854, rebuilt 1897); Catholic and Methodist churches (1855); primary school (1856); Presbyterian church (1857); and hospital (1857). An agricultural society was formed in 1856 and a borough council was proclaimed in 1857. Many of the buildings were made of bluestone, as were several large flour mills such as the Argyle steam mill (1857) near the Campaspe River and the Degraves mill west of Kyneton (1857). A later mill at the corner of Ebden and Piper Streets was built in 1862 and had continuous operation until the late 1930s; another of the same period, at the corner of Wedge and Piper Streets, ran until 1891 and then as a butter and cheese factory until 1974. Most of these buildings still stand, and the Kyneton museum in the former Bank of New South Wales (1856) in Piper Street publishes an illustrated guide to historic buildings. The Melbourne to Bendigo railway had a handsome station building (1863) at Kyneton. A racing club and a croquet club were established at about the same time and a bowls club in 1876. A site for a botanic garden was permanently reserved alongside the Campaspe River, west of Mollison Street, in 1867. With an area of nearly 20 acres, its upkeep was beyond the town’s resources until more was done in the 1880s with garden beds, a fernery and public facilities. Another period of neglect in the late twentieth century was corrected when several country botanic gardens were restored. An early State high school opened in 1902 in a large brick market building, and a technical school opened in 1906. A handsome high school was constructed in 1927 (536 pupils, 2014). The Catholic church had primary and secondary schools, including the Sacred Heart Ladies’ College. The Kyneton College (boarders and day pupils) offered alternative education. The livestock saleyards (1860) supported three large stock and station agents in the 1920s, and five in the 1950s. The flour mills and a malt factory were supplemented by the Lincoln hosiery mill, an envelope factory (1930s) and a fibro-sheet factory (1950s). McPherson’s Ajax pump foundry was a large manufacturer by the postwar years. There were two local newspapers: the Observer (1858-1925) and the Guardian (1870-). By the late 1960s Kyneton’s built heritage was apparent. An historical museum was established in 1970, and a succession of guides to the historic buildings and walking tours was published. Shops for tourists and visitors were opened in Piper and Mollison Streets, and former grand bank premises were given over to antiques and eateries. Although situated outside Victoria’s main spa country, Kyneton has a mineral spring near the Lauriston turn-off on the Old Calder Highway. It is marked by a nicely designed rotunda (1913). The Calder freeway by-pass (c1995) has not disadvantaged Kyneton’s visitation, and walking tours have been improved by it. The state government's Department of Primary Industry office in Kyneton, that provided support and advice to the region’s farmers, closed in 2012. The heritage-listed railway station is south of the town, keeping to the high ground needed for rail gradients. A walk northwards meets the botanic gardens half way, and a longer walk reaches the racecourse (15 meetings a year) and training tracks. The Kyneton golf club (1900) is further afield, off Black Hill Road, its location since 1950. In 2014 the Kyneton primary school council decided to relocate the school to a new site (280 pupils, 2014).